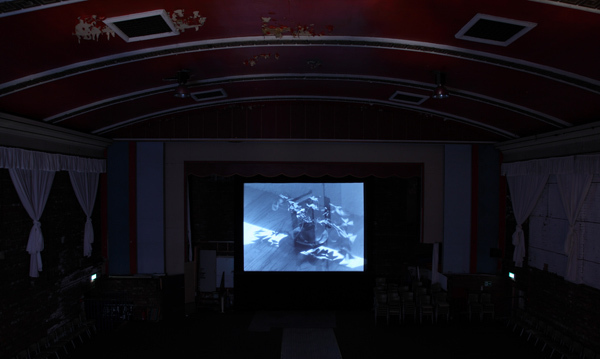 A new site-specific work by Lucy Skaer that revives an old Kalee film projector is currently on view at the Lyric Picture House in Leeds, England. Commissioned by Pavilion, the piece is on view until December 15. The artist will discuss the work on Thursday, October 6, at 7 PM. MAKING A WORK FROM THE POINT OF VIEW OF THE PROJECTOR is a way of escaping my own imagination. It’s an attempt to create the memory of the machine. Film for an Abandoned Projector began with finding such an object, which wasn’t easy. The projector didn’t necessarily have to be inside a cinema; it could have been in a warehouse or in a storage room. My only parameter was that I didn’t want it to be in a working cinema. Once we found it, we had to refurbish it. While that was happening I started to shoot a site-specific film that would be meaningful to the particular place in which the projector had been found. I like thinking of a machine as a kind of “animal eye,” like a cat’s eye, as in my previous work Rachel, Peter, Caitlin, John, which attempts to see outside of the human experience or viewpoint. Perhaps it’s a backward way of thinking about film, because the medium itself is made to play on any projector and intended to transport the viewer from a physical place into a new state of mind. This work walks a line between escaping into another reality and being very firmly located in the space. The film is made up of small “episodes” that are related not by content so much as by movement or contrasting shots—pairing very shallow shots with very deep shots. Some are colored panels I filmed in the studio as they moved backward and forward, toward and away from the camera. Some of the episodes make it hard to determine what’s been filmed, while others point toward a narrative. I’ve also been trying to connect things that happen in a frame, like a movement or a change in light, as a way to stitch the film together. I’m thinking a lot about how the projector itself will light the interior of the cinema, using either clear or color film leader so some parts will be a kind of an imageless return to the space itself. There’s a feeling of the film being made as you’re watching it, because some of the shots are of the projector firing up. There are also shots of the building itself and the church group that uses it. I think this feeling of being grounded or escaping is going to be a bipolar thing that keeps working its way out as the show goes on. People will also be able to walk into the projection booth and see it running. When we first got there, it’d been sealed up since the 1980s and there was film all over the floor––it was very romantic, dusty, and intriguing. Originally we wanted to keep it like that, but because the projectionist has to work, it’s been cleared out. I want the booth to be open for people to see the mechanics of it, to get a feel for the history and for the archaic sense of the projector itself.